When Planet X entered the inner Solar System in late 2002 - early 2003, it was not just the Earth that reacted, as it did with an increase in earthquakes, volcanism and extreme weather, the animal life on Earth also started showing signs of the approaching monster. Crazy Animal Behaviour: Reports of bizarre behaviour including animal attacks from normally passive creatures and spiders spinning webs over whole fields. Confused Animals: Whales and dolphins stranding themselves on beaches in droves or getting lost upstream in coastal rivers. 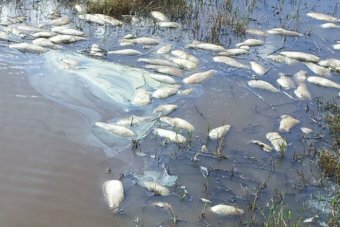 Large fish and bird kills: Flocks of birds falling dead from the sky and shoals of fish dying and floating to the surface of lakes, rivers and washing up along coastlines. Reports of crazy animal behaviour have included sheep that charged a farmer’s wife off a cliff, deer attacking a car and rabbits biting pedestrians. Spiders have spun webs over whole fields and caterpillar larvae have covered whole trees in silk. Other erratic behaviour among animals included a seeming loss of direction with whales and dolphins swimming inland and stranding themselves on beaches. Hundreds, if not thousands, of these events have taken place with the frequency increasing year on year. Poignant examples include the 20 tonnes of dead herring which washed ashore in Norway and 1200 pelicans found on a beach in Peru. Freshwater intrusion from the Bonnet Carre spillway is damaging aquatic life in the Mississippi Sound, with 13 dead dolphins and 23 dead sea turtles found along the Mississippi Coast in the last two weeks. The carcasses are being necropsied by Mississippi State University veterinarians at the Institute for Marine Mammal Studies in Gulfport. Executive Director Moby Solangi said the verdict is still out on the causes of death, but both the turtles and dolphins have skin and eye lesions consistent with freshwater damage. Solangi said 22 of the dead sea turtles are endangered Kemp’s ridleys, while two baby dolphins are among the most recent dolphin carcasses retrieved. Carcasses are being found in all three coastal counties, he said. Solangi said a total of 40 dolphins have been found dead so far in 2019. The Mississippi Department of Marine Resources also confirms the fresh water is damaging oyster reefs, particularly in the western Mississippi Sound. The U.S. Army Corps of Engineers opened the spillway for 44 days to protect New Orleans and other communities from Mississippi River flooding. Up to 210 cubic feet per second of fresh water poured through the spillway gates. The Mississippi Sound’s oyster fishery suffered “severe economic hardship” from the opening of the Bonnet Carre spillway for 48 days in 2011, according to a report from Mississippi State University. After the 2011 freshwater intrusion, the DMR oversaw replenishment of about 1,000 acres of oyster reefs in the Mississippi Sound, said Joe Jewell, DMR’s director of marine fisheries. A $10 million grant replenished those beds and helped sea turtles recover. Funding included pay for fishermen who helped with the project and otherwise would have been out of work because of the decimated oyster beds. Jewell said the impact of the fresh water did not end with closing of the gates on April 9. This year marked the 13th time in 90 years the spillway has been opened, The New Orleans Advocate reported. Although the spillway has closed, “the event,” as Jewell refers to it, is not over. “It takes two to three weeks, sometimes more, for all that freshwater to flush out,” he said. Solangi said the impact continues up the food chain. For example, blue crabs hide from predators in oyster reefs and turtles feed on blue crabs.Solangi said fish the dolphins feed on also are dying, so the food supply is lower for both turtles and dolphins. “This is the largest number of animals in a short period that we’ve been dealing with,” he said. Dolphin deaths also were reported in Louisiana after the spillway opened. The freshwater flows from the Mississippi River into Lake Ponchatrain and, from there, infiltrates the Mississippi Sound. The public can help by reporting dead or stranded marine life to IMMS. The number to call is 888-767-3657. Documenting turtle and dolphin losses will help secure federal funding to recover from the freshwater intrusion, Solangi said. The scope of damage will not be known for sometime. In addition to necropsies, DMR’s continuous sampling of water and aquatic life are accessing the damage. The violet, thumbnail-size snails washing up in Horseshoe Cove in California have never been seen this far north. By-the-wind sailors, a tiny relative of warm-water jellyfish, sprinkle the tideline by the dozen. The violet, thumbnail-size snails washing up here in Horseshoe Cove have never been seen this far north. By-the-wind sailors, a tiny relative of warm-water jellyfish, sprinkle the tideline by the dozen. And in the tide pools along the cove's rocky arms, as harbor seals about to pup look languidly on, a slow-motion battle is underway between native Giant Green and Starburst anemones, a species common in Mexico. The southern visitors are bludgeoning their northern hosts with poisonous white-tipped tentacles. Then there are the whales. As many as five at a time have been foraging in the San Francisco Bay, the vast inlet about an hour south of here along the wild Sonoma and Marin coasts. The number is far larger than in a normal year, when one or two might wander in beneath the Golden Gate Bridge for a day or two at most. These whales now are staying for as long as a month. And, for the first time ever, there are two species in the bay at the same time - grays and humpbacks, both usually speeding north to their Bering Sea feeding grounds this time of year. Instead, whale-watching boats are having more luck in the opaque waters off Berkeley on the bay's eastern edge than in the open ocean. Three grays have also washed up dead on bay shores in recent weeks, their stomachs empty. "Our guess is that they are superhungry, maybe looking for a little food before continuing north," said Bill Keener, a marine mammal biologist who has been tracking whales, dolphins and porpoises in the bay for decades as head of Golden Gate Cetacean Research. "But why are they staying this long? We can't really figure out what these guys are doing." The likely culprits: "the blob" and "the boy." Five years ago, the Gulf of Alaska warmed to record temperatures, likely due to a sudden acceleration in the melting of Arctic sea ice. Usually, a cold southern current flows along California. That year, the warm "blob" spread down the coast and, instead of blocking tropical species from moving north, it served as a balmy welcome to a variety of animals far from home. Then came El Nino, the roughly once-a-decade temperate current that flows north and east from the equatorial Pacific to the California coast. The two warm-water events came together - one rare but understood, one unprecedented and baffling - to form an ocean heat wave whose real-time and lingering effects may have permanently scrambled California's coastal ecosystem. 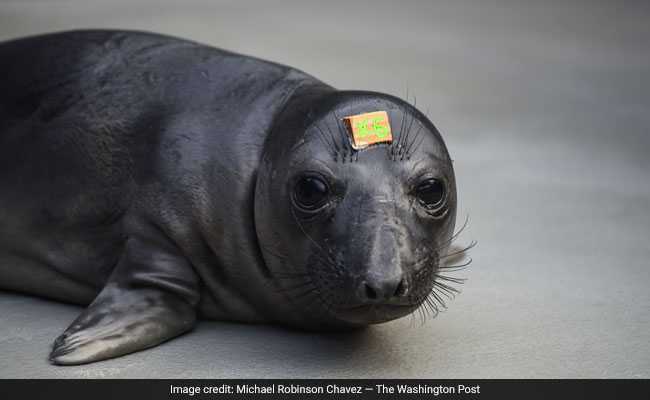 "This was like opening a door temporarily for southern species to move northward," said Eric Sanford, a professor of biological sciences who runs a lab here at the Bodega Marine Laboratory of University of California, Davis. "And the longer you hold the door open, the more opportunity you give southern species to move north." The door was not just ajar but wide open for several years. Today, there are still pockets of unusually warm water off California, doggy doors that continue to beckon tropical species that are strangers to its usually chilly 840-mile coastline. Last year, scientists identified a yellow-bellied sea snake that had washed up on Newport Beach in Orange County, the first time the tropical species had been found in California in a non-El Nino year. 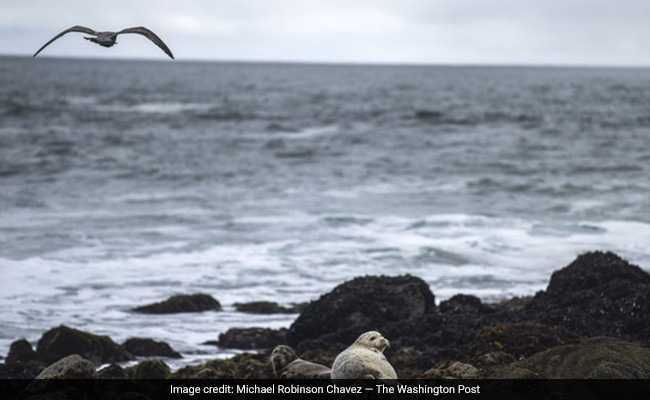 Then, last month, an olive Ridley sea turtle was spotted by lobster fishermen off Capistrano Beach, in part because a sea gull was resting on its back. The turtle migrates on warm currents, one of which may have swept it so far north. After unprecedented floods killed more than 80 people and damaged or destroyed 100,000 homes Iran is now bracing its self for swarms of locusts. Director of a department at Horkozgan's agricultural organization told Tasnim that Iran is facing the worst locust attack in the past 40 years. He said several swarms of locusts have come from the Arabian peninsula to Iran over the last 10 weeks, some of which have penetrated into farmlands of the province as far as 200 kilometres from the coast. The UN Food and Agriculture Organization (FAO) said in February that a locust outbreak in Sudan and Eritrea was spreading rapidly along both sides of the Red Sea to Saudi Arabia and Egypt. The FAO also noted that good rains have allowed generations of locust breeding since October 2018, leading to a substantial increase in locust populations and the formation of highly mobile swarms. The UN agency had also highlighted the control measures in Iran after at least one swarm arrived on the southern coast at the end of January. Adult locust swarms can fly up to 150 km a day with the wind and adult insects can consume roughly their own weight in fresh food per day. A very small swarm eats as much in one day as about 35,000 people, posing a devastating threat to crops and food security. Love our Lakes spokesman Martin Potts also blamed the decline in the quality of the lakes on the diversion of water from the rivers, but said the death of carp was good for the lakes system. Tundra swan deaths result of multiple environmental issues? COEUR d’ALENE — A recent report on dying tundra swans from the Idaho Department of Fish and Game discussed the potential for 2019 to be one of the worst years in terms of total death toll. According to the report, IDFG staff have received numerous calls about dead tundra swans in the lower Coeur d’Alene River Basin, particularly around Harrison Slough. The deaths are attributed to poisoning from mine waste contamination found in the wetland sediments where the birds forage, as well as seasonal weather factors that may have exacerbated the situation. Annually, there has been an average of roughly 150 Tundra Swan deaths in the area. This year, the early body count is ahead of where it is usually at this time. According to Kiira Siitari, a regional communications manager with IDFG, the previously released report was a warning that more deaths than usual could be expected, not necessarily that it was a guarantee. The hypothetical scenarios within the report ranged from timing and distribution of melting ice, water levels, as well as the length of time the swans stayed in the area. The water level situation is the one hypothetical where the mine waste contamination really comes into effect, but not for any reason other than odd seasonal weather. Swans feed on the roots and tubers buried in the wet soils, so the deeper they dig, the more pollutants are encountering. That water level issue, paired up with the length of time the swans remained in the area pointed experts to their last hypothetical, but they can’t confirm these possibilities until the migration is complete. Siitari did add that just because the numbers are higher right now does not mean that they will eclipse the usual average of Tundra Swan deaths. Historically, the mining industry in Shoshone County had dumped their mine waste into the Coeur d’Alene River where they washed down the river and settled along the river bottoms, as well as in the marshy wetlands. Efforts to reduce contamination exposure in tundra swans and other wildlife are led by the Restoration Partnership, of which Fish and Game is a partner. In 2018, the partnership completed a comprehensive restoration plan that laid out a strategic framework for restoring natural resources, such as waterfowl, that are impacted by the release of historic mine waste. Approximately $140 million is available from settlements to implement the plan. These large-scale habitat restoration efforts have already begun. Starting in 2006, the Restoration Partnership led a 400-acre restoration project on private farm lands near Rose Lake, providing clean marsh habitat for swans and other wildlife. In 2015, Fish and Game habitat specialists restored another 65 acres of wetlands adjacent to this property in the Robinson Creek Project with funding support from the Idaho Department of Environmental Quality, U.S. Environmental Protection Agency and the partnership. ATHENS, Greece (AP) — The Aegean Sea has seen a "very unusual" spike in dolphin deaths over the past few weeks, a Greek marine conservation group said Monday, adding that the rise could be linked to massive Turkish naval exercises in the area. Fifteen dead dolphins have washed up on the eastern island of Samos and other parts of Greece's Aegean coastline since late February, according to the Archipelagos Institute. The group said while it's still unclear what caused the deaths, the spike follows the Feb. 27-March 8 Turkish "Blue Homeland" exercises — the country's largest ever — that made constant use of sonar and practiced with live ammunition. The deafening noise of sonar, used by warships to detect enemy submarines, can injure dolphins and whales, driving them to surface too fast or beach themselves — with sometimes fatal consequences — to escape the din. "We can't say that the Turkish exercises killed the dolphins, but the fact that we had such an unusual increase in the number washed up dead — and what we have seen must be a small percentage of the total because the Aegean has a long coastline — coincided with exercises that used more than 100 ships," Miliou said. "(The deaths) are very worrying and we can't say that the two events are unrelated." After several mass beachings of whales, NATO, to which both Turkey and Greece belong, has adopted a code of conduct for using sonar that is designed to better protect marine mammals. Miliou said the alliance's rules are respected by the U.S. Navy, which has a strong Mediterranean presence, and the Greek navy. "There's a new (military) generation in place that doesn't want to harm the environment in the name of national sovereignty," she said. But Miliou said it was unclear whether Turkey has implemented the guidelines. She said the Greek government in Athens should raise the issue in talks with Ankara, particularly ahead of new Turkish naval exercises in the Aegean. "With these giant exercises ... strain is placed on the entire marine ecosystem, including fish and plankton, because (they) cause intense noise pollution from which marine life can't escape," she said. Miliou added that the Aegean Sea "can barely handle the strain we are already subjecting it to," such as pollution, overfishing and heavy marine traffic. Cape Town - The bodies of 14 bronze whaler sharks were discovered near Gansbaai earlier this month. The sharks are listed as near threatened on the International Union for Conservation of Nature list, because they are being targeted in commercial and recreational fishing for their meat. Bronze whaler sharks are also often spotted during shark-cage diving in the small town. Great white sharks are becoming rare sights during cage diving because of environmental factors. The carcasses of 13 bronze whaler sharks were discovered washed up on a beach near Gansbaai on March 5. Another shark carcass was found between Kammabaai and Voëlklip. Natalia Drobniewska, the operations manager at the SA Shark Conservancy, said one of the sharks was pregnant. Sharks washing up on the beach is not a common phenomenon. Georgina Pendell, a marine biologist for the White Sharks Project, said in the year she worked for the organisation, she didn’t hear of any similar cases. It is still unclear what led to the sharks being washed up. “There are a lot of possible reasons for the sharks to wash up: being hit by a boat, getting stuck in fishing nets and then dying, getting caught on long lines and then discarded back in the ocean, natural causes and sickness,” Drobniewska said. Pendell said there was a trawler near to where the sharks were found. “They might have gotten tangled in the nets, died and then got washed on to the beach,” Pendell said. OCEANPORT, N.J. (AP) — State environmental officials say thousands of dead fish have washed up in a New Jersey shore community. The adult menhaden were found Saturday in creeks and bays in Oceanport that are part of the Shrewsbury River estuary in Monmouth County. Officials say the deaths occurred after a large school of menhaden were pursued by predatory fish and depleted the oxygen from the shallow water. Officials took water samples and confirmed low dissolved oxygen in the creeks. Local crews were working to remove as many of the fish as possible, while the rest will decompose and eventually sink. Menhaden are small schooling fish that play a vital role in the ocean food web. They are also harvested commercially for fish oil and use as aquaculture feed. Biologists investigate after finding dozens of dead ducks near a rainwater runoff in a southeastern Calgary park. Brett Boukall, a senior wildlife biologist at Alberta Environment and Parks, said the authorities around the 10 o'clock had been informed on Wednesday. He said samples would be sent to the lab, and he hopes they have more information in a week become. Olav Rokne, a spokesperson for the agency, said that they currently do not exactly have the number of dead birds "It has been found that it is more than a dozen." Calgarian Wayne Clarke shared photos of the dead birds with CBC News including a close-up of a bird that seemed to have a well-preserved head and wings while the corpse might have been caught. Rokne said it appears that the dead birds are only near the rainwater drainage areas in southeastern Calgary Park. He said in winter that it is common for waterfowl to gather in open water areas such as the Bow River or the storm water ponds and whitewater areas. Temperature lowers the areas of available open water decline, l overcrowding. "For those birds that remain in these crowded, open waters, there can be hunger, extreme exposure and even diseases that can lead to deaths." It's too early to say for sure but this could be the cause of the incident at Elliston Park, "he said. HUNTSVILLE, Ala - On Wednesday morning, a viewer alerted WHNT News 19 about a scene that looked like it was straight out of a movie. More than 60 dead European Starlings were scattered across a small portion of Moores Mill Road in Huntsville. It appeared that they all died at the same time. An aviary expert at Auburn University said he suspected the birds could have been exposed to poisonous fumes. Many people took to social media expressing concerns about where the fumes could have come from. WHNT News 19 found a driver who actually witnessed what happened to the birds. We learned that the birds actually died on Monday but more importantly, the witness says there is nothing for the public to worry about. "Birds just scattered everywhere. It was like a bomb exploded," said Shiela Price, a woman from Meridianville who witnessed what happened Monday afternoon as she left the grocery store. "We had left Kroger and was headed toward 72 on Moores Mill Road," she explained. That's when Price says several flocks of birds caught her attention because they were flying in a strange pattern near the road. A few seconds later one large flock dove straight into a white Chevy pick up. "One swarm of the birds just looked like it attacked that truck. They just swooped down real quick and hit the truck," she said. She says she thought it was important to contact WHNT News 19 and tell her story. "Because I was reading on your post and a lot of people were worried that are residents there, that some kind of gas or toxic fumes, or something you know, going to endanger them. And so I wanted to come forth and let everyone know what really happened," she explained. But what really happened? Why would so many birds dive bomb a car? WHNT News 19 asked Auburn's curator of birds, Dr. Geoff Hill. "It was probably a life and death chase where they were eminently going to be caught and eaten," he said. He says when birds are in danger they fly in tight formations to try and protect themselves. "They fly really low and really fast, and that's when they can make mistakes and hit windows, or a truck because it's really life and death," he said. Dr. Hill says new research suggests when birds fly in formation the ones in front navigate for the entire flock, which could explain why they all 60 of them hit the truck. He says it is extremely rare for an entire flock of birds to run into something. He also doesn't believe any toxic fumes or poisonous chemicals were involved in the birds' strange behavior.